A touchscreen e-reader to rival the Sony Reader Touch has landed in the UK, with Waterstones putting the iRiver Cover Story up for pre-sale. 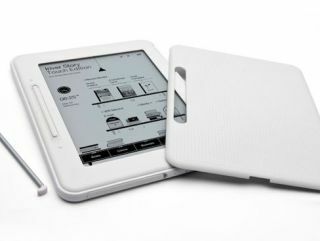 The ebook reader offers touchscreen controls, and supports a number of file formats including EPUB, PDF, TXT, FB2 and DJVU. It has a USB port for transferring content on to it and an SD card slot is also on board. When it comes to extra features, the iRiver Cover Story can display Microsoft Word, Excel and Powerpoint documents and you can also look at image files on the device. The iRiver Cover Story has been updated, so it is lighter than previous models. The screen on the e-reader is six inches in size and offers 600 x 800 resolution. Unlike Sony's touchscreen ebook, the iRiver Cover Story has Wi-Fi connectivity and it comes with an email client, so you can check your mail on the go. The Wi-FI Cover Story (EB05W) is available to pre-order now exclusively through Waterstones.com and is priced at £149.